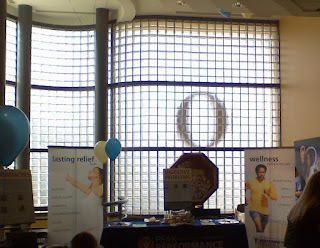 Mark R. Brand: The big "O"
I got to see the inside of Oprah's Harpo Studios on Friday when we did a health fair there. It was a pretty impressive building, and the staff were highly competent and friendly people that really made it fun and easy for us. I only managed to get one decent photo, I tried hard not to be That Touristy Guy, but I got a neat one of the inside of the main, curvy window with the big O on it. We were beyond lucky to be in there, since it had air conditioning and the rest of the exhibitors were outside in the absolutely sloppy 90-degree/90% humidity day. They also catered us some suprisingly tasty hot beef sandwiches for lunch. I guess you could call it a journal. Father, Husband, Author, ... golfer?